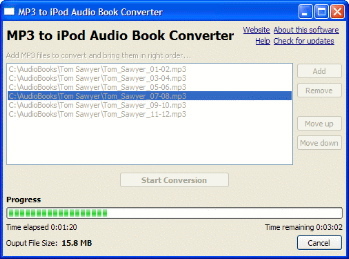 freeiPodsoftware.com has a free MP3 to iPod Audio Book Converter that turns any number of MP3 files into one iPod Audio Book File. The advantage of doing this is that you can make use of the advanced audio book functionality of your iPod. For example, your iPod remembers where you were listening in your audio book, so you can alway start listening where you stopped the last time. You can also adjust the speed of playback, if you want to listen to the files playback faster or slower. MP3 to iPod Audio Book Converter runs on Windows 98, Me, 2000, XP and Vista. Mac and Linux versions are planned.